Leave your suggested caption in the comments. erm…well, yes…clearly one does not want to take the easy shot with a posterior joke. 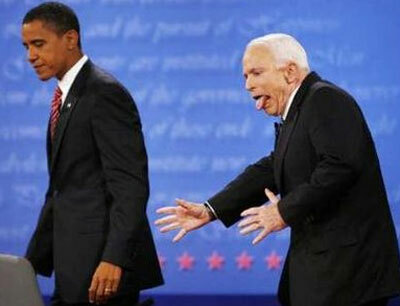 Sen. McCain suffering a sudden paroxysm upon a moments clarity regarding his economic policy. Well, anyway, that’s how it makes me feel. I agree with Mr. Crotchety, there is a striking resemblance to Bill the Cat. Ack!